I've had suggestions of buying a proper "antependium" which is pulled taut over a frame, and looks something like the second picture, below. But I was also thinking of draping some orphreys such as the third picture, which is my other parish. Comments? I would say, either leave it as it is--there is an elegance about it in it's simplicity. Other wise, I would go with option #1. I have seen so many awful liturgies at altars with orphries. I plead ignorance. I have googled it but I'm still not clear. WHAT is an ORPHREY??? 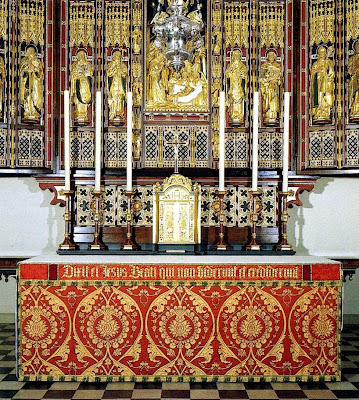 See those ornate bands of cloth on the altar in the third picture? 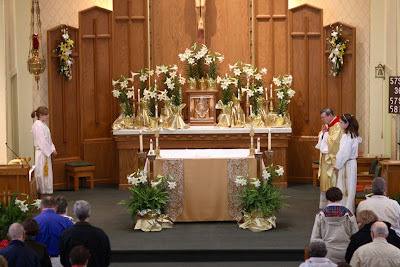 Thanks - really - because my guess, based on the word drape - were those gold 'thingys' on the old altar. Clearly not close! I'd go with the orphreys. I like a classic, simple look. I would also think it would be easier to clean if an accident happened and easier to switch around for the seasons. Get rid of the altar girls. The antependium in the second picture is really nice. I think I would choose that! "get rid of the altar girls"... should they be executed, banished, forced to wear a burka? Women served Jesus all through the Gospels. Why should they now be forbidden to do so?